If you are like most investors, your retirement portfolio suffered big losses during the market crashes of 2000 and 2008, and you are looking for a solution that will help you avoid ever losing money like that again. Stock market volatility drove investors to seek safety in principal protected investments. One of the most popular principal protected investments is the fixed index annuity. One of the questions we hear quite often is, “how can you guarantee that my Fixed Index Annuity won’t lose money?” In this article, we will give you an inside look how fixed index annuities protect your principal and allow you to lock in market index gains. When you purchase a Fixed Index Annuity, the insurance company takes the money you’ve given them and adds it to a portfolio that buys high-grade corporate and treasury bonds that earn an income stream in the form of guaranteed interest. The insurance company uses that interest – and that interest only – to conservatively invest in the market. Here is an example. If you purchase a $100,000 Fixed Index Annuity, the insurance company invests that money in high grade corporate and treasury bonds, which draw an income stream of, for this example, let’s say 5%. Then they take that 5%, or $5,000 of income, and invest in the market based on the index, or combination of indexes, you choose. So, to review, the principal of $100,000 invests in bonds that create an income stream, and then only the interest earned participates in stock market-related investments. This is how insurance companies are able to guarantee that you won’t ever lose money––because your principal has never been at risk in the market… only the interest. If the market goes down, the $100,000 that the insurance company put into the bonds is still worth $100,000. The $5,000 invested in the stock market may lose value, but your Fixed Index Annuity contract guarantees that you see none of that loss. So, what if the stock market goes up? If the market goes up, that $5,000 that the insurance company put into the market would be worth more. And, you would participate in the growth. This is how Fixed Index Annuities allow you to benefit from stock market gains, while shielding you from any losses. 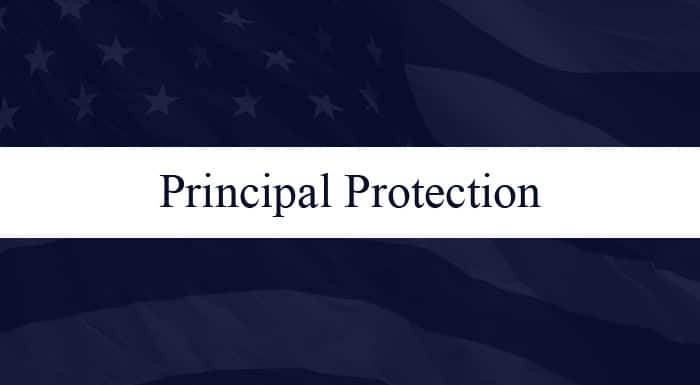 Principal protection is one of the most attractive features of a fixed index annuity and is one of the main reasons that annuity sales last year reached record territory in the United States. Fixed annuity sales for 2016 reached a record $117.4 billion which was up a whopping 14% from 2015. FIA sales in 2017 are showing no signs of slowing down. Tune in next week as we delve deeper into the workings of fixed index annuities and cover the topic of point-to-point crediting for annuities. In the meantime, please feel free to call us at (972) 473-4700 if you have any questions or fill out our contact form to schedule an appointment. We look forward to hearing from you soon!